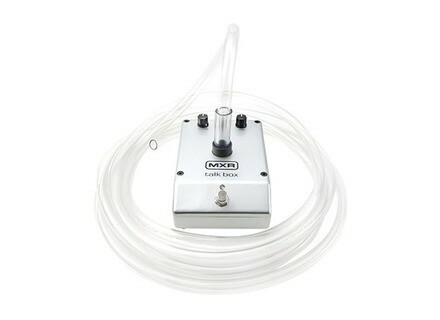 M222 Talk Box, Talkbox from MXR. be23's review (This content has been automatically translated from French)" Spectacular!" 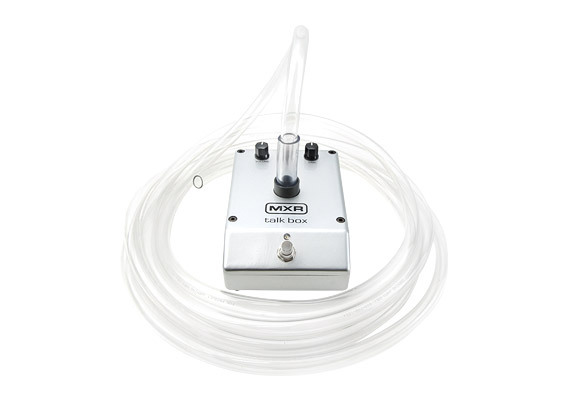 It is a Talkbox a new genre: the need to connect between the amp head and cabinet, the MXR M222 works like any effect pedal since preamp and amp miniaturized are integrated into the solid metal housing. Specifically, in "off" mode, it operates in "true bypass", and once activated, the signal normally hand to the guitar amp is mutated, the M222 sends the amplified sound in the pipe, the sound enters the mouth and is picked up by the microphone singing and sound. Moving jaws, cage resonance varies and the sound is modulated by: Peter Frampton is then in place (almost)! There is some time to adapt to be able to properly use this special effect. This includes placing the tube in the mouth properly so it does not clog with the tongue or inside the cheek. Personally I gently wedge between the molars and go! Second step: moving the mouth in order to tame the sounds that result: we then have an effect that is reminiscent of a very vocal species wah, very cool. Step 3: is articulated vowels. This is where the Talkbox makes sense: the audience is often glued to hear weird sounds that result. Step 4: we make words or phrases, and then trick: guitar speaks wine 'gods! This is just huge, sounds obviously have a voice that no side can reproduce wah. It gives a unique organic side a riff or a solo, an almost animal side. Having said this effect is in my opinion to use sparingly to keep the element of surprise. I love this Talkbox. I have at least one question or intrigued by concert look, and as I used little, people are always glued! This is a very special effect, but it lets out of the beaten track, MXR has produced an extremely serious product, whether in terms of build quality or sound realism. Christou28's review (This content has been automatically translated from French)" Good but be careful problem"
In the box, the rather heavy foot, the pipe and the corresponding 18V power supply (not very practical if you have a rack power supply 9V-12V). The effect is really cool, a 3 knobs Volume / Tone / Gain, the gain is much more useful on a guitar to give sustain, it's pretty easy to setup, use a slightly less. It was after that things go wrong. I noticed using it again in the bypass system was a bit crappy I said: not to use the particular problems, j'enclenche pedal I use it, I turn it off and sound, I have to unplug the jack and back for sound. It is by removing a buddy has targeted the problem, namely the magnet of the speaker too close circuits that comes into conflict by moving the speaker a few millimeters it works but of course the case of the pedal is tailored so it is quite complicated, mine is closed with blundering. Tin-Man's review (This content has been automatically translated from French)" Beautiful tool to master." Basically you speak your instrument. Used in funk, rock and pop (Daft Punk) is a very flattering effect that will make your solos or grooving rhythms. The effect can approach a wha-wha pedal but still really under amphetamine. It is analog and the connection is simple: In and out .. vala vala! This pedal, simply connect the instrument (keyboard or guitar so ...) and in the in the link out to your sound or mixer board. That is the simplest. I will test other configurations (connecting a guitar multi-effects and multi-effects to the talk box). But let's say it alone is already the job well. 3 buttons: Volume, Tone and Gain. And tone volume is known, the gain adding a little to the effect of crunch. These three knobs are not only easy to operate but also very effective. There is no need for manual (there are in the box, it is amber and English). However, if for whawha front of the microphone is quite simple, to really make it sound and talk this end, it takes a bit of control and most importantly, from the outset, although fit and attach the hose from the microphone. I use this effect with guitars. I have not yet tested on a keyboard (I just saw qq video of Roger Troutman who knows a tad). Very flattering and very effective indeed was fun from the beginning to make whawha then searching there are other sounds, other modulations, then try to speak a little but the sentences are understandable, it is necessary train. I use it for 24 hours (yes) this is the first model of TB testing purpose. When the fate of the box we see that it's sturdy, all brushed aluminum with blue LED when in action. Q / P good, even if it is not given, manufacture, at first glance, has serious air. With experience, you do again this choice? ... I dunno, I just expect to have the experience, but as it immediately now, I would say yes.